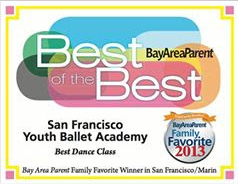 2) SFYBA voted Best of the Best in San Francisco and Marin for 2013-2018 by Bay Area Parent magazine readers. 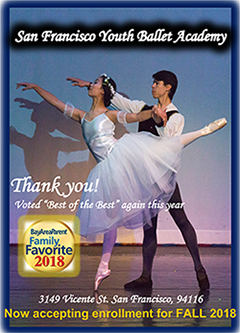 3)	The SFYBA studio and dancers were featured nationally in the 2017 Clorox ® Television and Internet Ad Campaign "Clean Matters: Clorox® is the beginning, what comes next is everything"
4) In 2018, Athleta ® chose SFYBA dancers for its 2018 ad campaign for its girl's clothing line. 5) SFYBA was the featured entertainment at the 2015, Google corporate holiday party at San Franicisco City Hall. 8) San Francisco Youth Ballet dancers featured at the “Kick-Off” celebration at Westfield San Francisco Centre on Friday 11/25/2011 with special guest presenter, Olympic Gold Medalist Kristi Yamaguchi.